Professional Grade Over the door Basketball Hoop with Pre-Installed Door Hooks, GREAT for Kids and Adults too!! With Steel RIM!!! Now W/ 2 Basketballs & PUMP! Makes a Great Birthday or Fun Gift Idea! 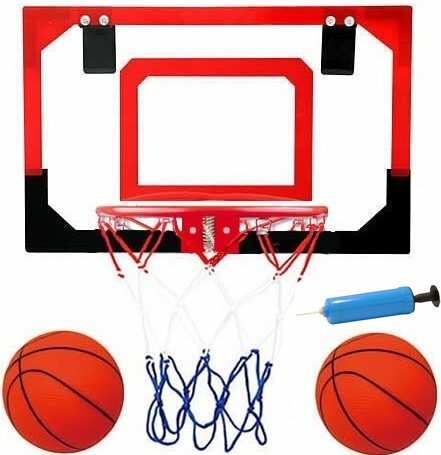 This Over the Door Basketball Hoop will keep Kids and Adults alike entertained for Hours on end! Designed with the ultimate durability to ensure many years of fun play; its Shatter-Proof Polycarbonate backboard and Durable Spring Guarantees the ability to Slam Dunk without hesitation. Make ANY SPACE your own MINI NBA Court!! It is perfect for every basketball enthusiast. Whether in an Office or in a Bedroom or behind almost Any Door, it will keep everyone entertained for hours! Mini Professional METAL STEEL Rim with a 5" Diameter in Size & RED-WHITE-BLUE NET!! The padding on the backboard and the design of the preinstalled large door hooks ensure protection from any door damage despite any rough play. It encourages Kids to share and play together building relationships through fun play and memories forever. It is also Great for Parent-Child interaction. The ease to assemble and dismantle makes it the perfect asset for mobile play, great for indoor or outdoor use. This is definitely a must buy for anyone who loves basketball and wants an upgrade from shooting crumbled paper into a garbage bin. A Savvy investment for a SavvyStreet kind of kid! 100% SATISFACTION GUARANTEED- Comes with a 30-Day money Back Guarantee! We value our customers! SLAM DUNK ANYWHERE, ANYTIME - This professional grade over the door basketball hoop is guaranteed to ignite and foster your inner basketball athlete. With its clear, shatterproof Polycarbonate backboard you're guaranteed a free pass to slam dunk anywhere, anytime, without hesitation. It's simple, bragging rights are just a click away! COMES WITH 2 BASKETBALLS AND PUMP! Includes RED, WHITE,& BLUE NET!!! FROM THE PLAY ROOM, TO THE DORM ROOM OR, THE BOARD ROOM- Designed with the ultimate Mobility by SIMPLY removing it from door and Adding it to another door or room. From the playroom, to the dorm room or the board room; this is the perfect addition for every basketball enthusiast's equipment collection. EASY INSTALLATION WITH NO DAMAGE TO YOUR DOOR- Included are two Pre-installed large door hooks for easy mounting, designed with attention to detail and the ability to open and close the door with no resistance. Takes the worry away and lets you get into the game. NO Drilling or holes needed. SHATTER PROOF BACKBOARD - STURDY AND DURABLE- Solidly built backboard and hoop, very sturdy and durable. With SPRING-ACTION Rim, makes it even better to SLAM DUNK knowing it will spring back. ENCOURAGES SIBLING INTERACTION- Suitable for both adults and children. Perfect for mobile play and great for Parent-child bonding and also Sibling-Sibling interaction! It encourages kids to share and play together building relationships through fun play. If you have any questions about this product by SavvyStreet Kids, contact us by completing and submitting the form below. If you are looking for a specif part number, please include it with your message.